Swizec Teller published on December 6, 2018 in Front End, Technical. Christmas movies are the best movies. How much do they make at the box office? Show the power law distribution curve with a vertical barchart. Styled components for styling, D3 for scales and data loading and parsing, hooks to hook it all together. Not that hard, as it turns out. You need a dash of useState to save the data you load, a bit of useEffect to run data loading on component mount aaaand… that’s it. Goes in your App function. The useState hook takes a default value and always returns current state – data – and a setter – setData. useEffect runs our function on every component render. After committing to the DOM, I believe. 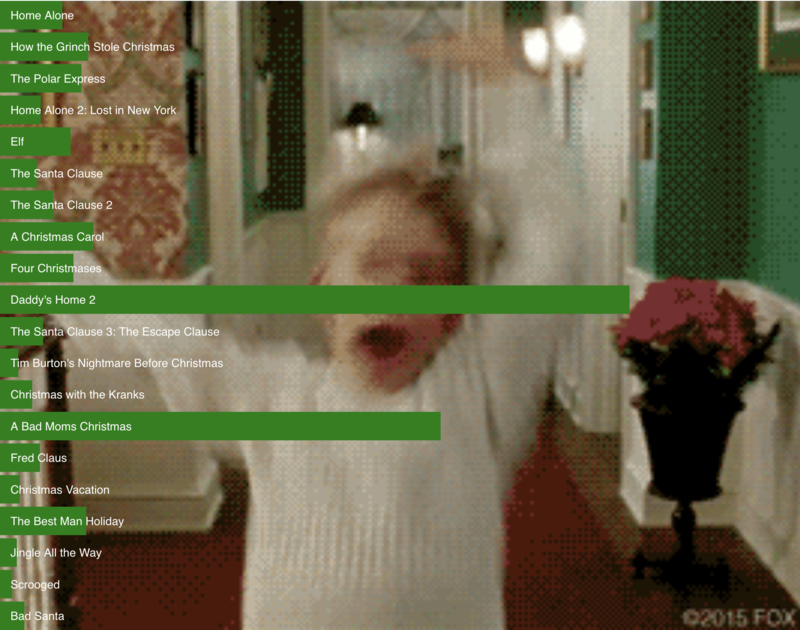 We use d3.tsv to load and parse our Christmas movie dataset, use a parsing function to transform each row into an object with all the info we need, then call setData when he have it. Movie box office revenue follows a pretty clear power law distribution. The highest grossing movie or two make a lot more than the next best. Which makes way more than next one down the list, etc. But how does age factor into this? Home Alone has had 28 years to make its revenue. Daddy’s Home 2 is only a year old. A useState hook gives us current state and a setter. We use the state, perYear, to define a value accessor function, and a butto’s onClick method to toggle the value. We’re going to use that value accessor to render our graph. Makes the switch feel seamless. First, you need this bit in your App function. It renders in an SVG, if data exists. That data && ... is a common trick. The return value of true && something is something, return value of false && something is nothing. Means when data is defined, we render; otherwise, we don’t. The VerticalBarchart itself is a functional component. We said no classes right? We can define our D3 scales right in the render function. Means we re-define them from scratch on every render and sometimes, that’s okay. Particularly when data is small and calculating domains and ranges is easy. Once we have a scaleBand for the vertical axis and a scaleLinear for widths, it’s a matter of iterating over our data and rendering styled and components. Notice that we use the value accessor function every time we need the value of a datapoint. To find the max value for our domain and to grab each individual width. That smooth width transition effect? That’s just CSS.